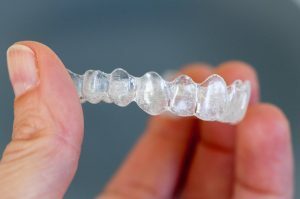 Invisalign uses a series of clear plastic aligners, which are worn over the teeth. Your teeth will gradually move into their correct positions as you progress through the series of aligners. Since the aligners are clear, no one will ever notice you are undergoing treatment. The trays are removable, so you will not have dietary restrictions, like those of metal braces. Overall, treatment is shorter and more convenient, only taking about 12 months. You will benefit from a comfortable and sophisticated option to straighten your teeth. Almost everyone is a candidate for Invisalign. However, you will require a thorough consultation to ensure the treatment is right for you. While it is highly effective, it cannot be used for those who have severely tipped or rotated teeth. In addition, if cannot be used to fix overly large gaps or bite issues caused by skeletal problems. Yes. However, you will need to remove the aligners. You should only drink water when wearing the aligners. You should not eat or drink anything else. While the aligners are durable, they are not made to withstand chewing. Not to mention, foods and drinks can stain the aligners, causing them to lose their transparency. After determining you are a candidate for Invisalign, we take scans to create your aligners. You will need to wear the aligners for 22 hours per day, only taking them out for eating and cleaning. You will wear each aligner in the series for about two weeks. During your treatment, you will need to come into our office every few weeks so we can monitor your treatment. On average, treatment takes about 12 months. At the end of your treatment, you will require a retainer to prevent the teeth from moving back into their previous positions. Although all insurance policies are different, your insurance may cover part of the costs. Depending on your exact coverage, your orthodontic insurance may cover as much as $6,000 of the treatment. In addition, any additional procedures required before treatment may be covered as well. We will help you maximize the value of your insurance policy to keep out-of-pocket costs to a minimum. Lancaster Family Smiles offers consultation and treatment for Invisalign. If you are ready to get a new, straight smile, contact our office today to schedule your appointment.